The fly fishing was great as you can tell from the photos, but the ride waiting for us on Saturday was even better. The group I was riding with consisted of Todd Quinn, a member of the Red Burro Cycling Team from Las Vegas; Scott Davis, the overall and general tough guy of the group; Curt LaBelle, who was riding in his first ever century; and Rick LaBelle, Curt’s older brother and recent finisher of Idaho 70.3. 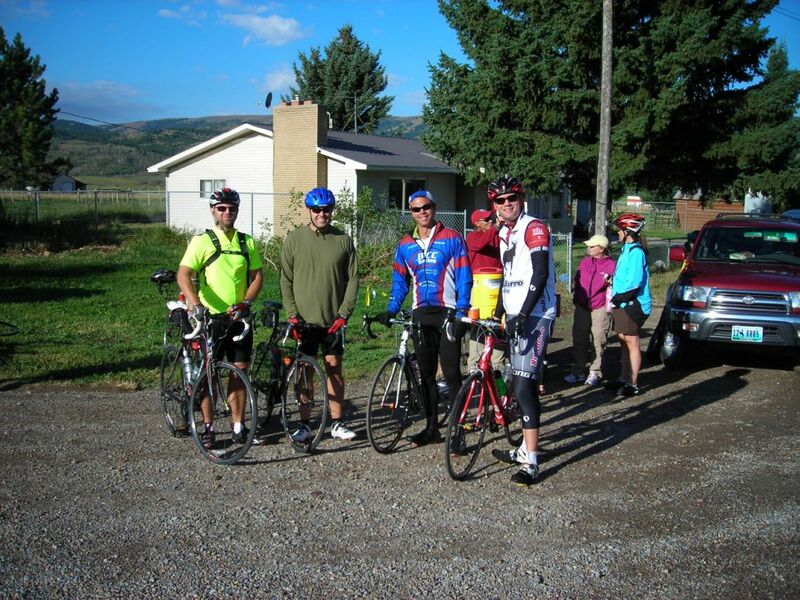 Scott and I have ridden together before, but the rest of the group hasn’t ridden with each other. Todd is by far the most experienced in the group at riding as a paceline and coordinating tactics that way. The ride itself was fantastic. The course at the CASVAR is beautiful and with only 65 registered riders, this century has to be one of the best kept secrets in the cycling community. The rest stops are well organized and stocked and I loved interacting with the volunteers who ran them. I was a little sad that there were so few riders out on the course – I think there were about 10 in the century division. If you can, I would add this ride to your calendar in the future. Everyone really did well, even our first timer. The longest ride he had done to date was just over 40 miles if I recall correctly, which made miles 75-85 a little rough for him. 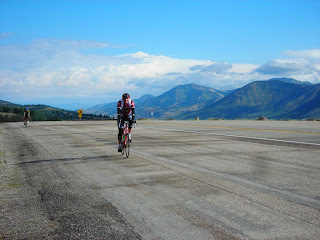 The weather was a little uncooperative as we hit a 35-40 mph headwind at about mile 70. As bad as the wind was, the rain started and the temperatures dropped at that same point. I am happy to admit that as tough as we are as a group, we did pull over and found shelter in a storage garage. 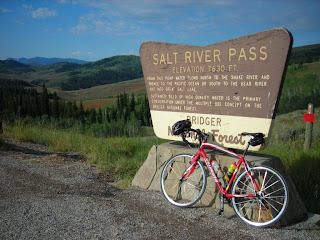 Salt River Pass where we humped it up and overs. I didn’t know Rick took this shot, but it is a good memory. 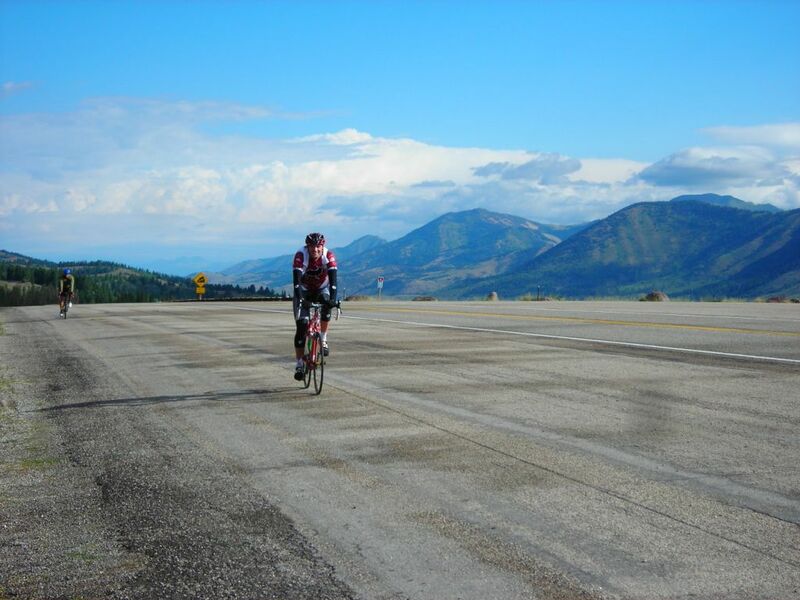 Todd Quinn cresting the Salt River Pass. LOTOJA comes the opposite way on this road, so the CASVAR is a great way to get to know this section of the course. Man you can tell I have gone up to 185 lbs. from my 168 lbs. Ironman weight. 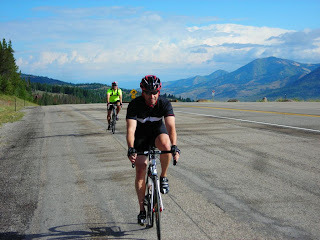 This is Curt and I coming up to the top of the Pass. I loved riding with him. He and I laughed a lot about college days. You would have been fine Nicole — you have the 1/2 IM in a couple of weeks. You could have lead the group without any challenges. Looks beautiful. I admire events that go on despite low numbers. It proves they are not just in it for the money. Me likes that.